The Catholic University of America is a private institution that was founded in 1887. It has a total undergraduate enrollment of 3,572, its setting is urban, and the campus size is 184 acres. It utilizes a semester-based academic calendar. The Catholic University of America's ranking in the 2016 edition of Best Colleges is National Universities, 123. Its tuition and fees are $40,932 (2015-16). 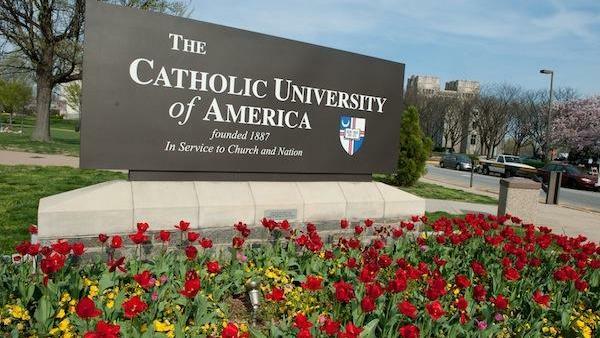 Catholic University of America, as its name suggests, is the national university of the Catholic Church. Students take several courses in theology and philosophy before graduation, and the Campus Ministry holds worship services and offers leadership opportunities to interested students. For other ways to get involved, Catholic University students can check out more than 80 clubs and organizations. The school's Cardinals athletic teams compete in the NCAA Division III Landmark Conference in every sport except football. The football team plays in the Old Dominion Athletic Conference. Freshmen and sophomores are required to live on campus, and because the university has a stop on Washington, D.C.'s public transportation system, the Metro, students are just a short trip away from Capitol Hill and other national landmarks. The school is home to about 20 research facilities, including the Institute for Policy Research & Catholic Studies. For graduate students, Catholic University runs the Columbus School of Law, a Department of Education and a School of Engineering, among other academic departments. There is also the Theological College, a seminary for male students preparing for priesthood. Among the many notable graduates of Catholic University are alumni such as actors Jon Voight and John Slattery; Robert Craves, co-founder of Costco Wholesale Inc.; and James Vanderslice, a former Dell Inc. executive. Unique qualities and programs of the school that influence students with particular abilities and interests to choose it over similar schools: Do not include quotation marks. Limited to 4000 characters. According to the school, The Catholic University of America is unique as the national university of the Catholic Church, with the added distinction that all undergraduates combine a base curriculum in the liberal arts with more in-depth courses from their major fields of study. Private and coeducational, CUA has 12 schools. Ten schools award undergraduate degrees: architecture and planning, arts and sciences, business and economics, engineering, music, nursing, philosophy, professional studies, social work, and theology and religious studies. All 12 schools grant graduate degrees. The student body of Catholic University totals nearly 6,700; of those 3,500 are undergraduates. The University was founded in 1887 as a graduate institution. That foundation offers undergraduates unique opportunities to conduct scholarly and scientific research in their fields of study, working closely with faculty. CUA undergraduates begin their academic career with the First-Year Experience, which introduces them to philosophy, theology, rhetoric, and logic through study in small, supportive learning communities. This coursework engages them in thinking about, discussing, and writing about the great questions that have shaped human history and that continue to confront us today. Students have unique opportunities to address those questions worldwide through CUA's education abroad programs. Students in all majors can find semester, yearlong, or summer-only opportunities for study on five continents. In September 2015, the Rome Center of The Catholic University of America and Australian Catholic University will open, offering newly renovated living quarters for undergraduates, a wing for graduate students, apartments for visiting faculty, a studio for architecture majors, a chapel, and a garden, among other amenities. Politics majors can choose internships in the British or Irish houses of parliament, or the European Parliament or Commission. Architecture students can study the marvelous buildings of Barcelona, Rome, or Paris, or, in the award-winning Spirit of Place Spirit of Design course, engage in a design-build project that begins in the studio and ends building a project in remote locations in such countries as Peru, Ireland, and Finland. Students in engineering can fulfill some of their academic requirements at the Hong Kong Polytechnic University. Nursing majors can learn valuable intercultural lessons at Australian Catholic University as well as take part in mission trips to Central America over the summer and on spring break. Through Campus Ministry, CUA students also embark on mission trips to Central America and Jamaica. In the nation's capital they serve poor, elderly, homeless, or otherwise disadvantaged people through homeless food runs, work with Little Sisters of the Poor at the Jeanne Jugan Residence across the street, and at So Others Might Eat. The long history of the University in Washington, D.C., offers CUA students an incredible range of cultural and professional opportunities, most accessible from the D.C. Metrorail system, which is adjacent to campus. In fact, students at the University have the best of both worlds: They study and live on 176 acres, the largest campus in D.C., where they can enjoy a complete collegiate experience. They also are located in the heart of the United States capital, a 9-minute Metrorail ride from Capitol Hill, the Smithsonian Institution, Supreme Court, Library of Congress, and Union Station. In short, students from around the United States and numerous foreign countries find that CUA's academic offerings, Catholic foundation, stunning campus, and extensive off-campus opportunities make it a desirable educational destination.